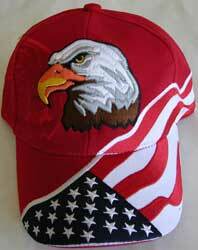 Quality USA Flag Eagle hats are back with a new and even more patriotic design. Embroidered with 100,000 stitches, this quality constructed hat will become a longtime favorite. 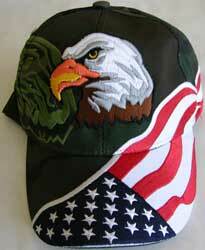 A large eagle adorns the top of the hat (with a shadow of the eagle in the background (look closely at the photograph and you will see it) and a US flag drapes across the brim and around one side of the hat. Below the velcro adjustable opening in the back are the words "In God We Trust" with a small embroidered flag. Available in Navy, Red, White, Light Camouflage, Green Camouflage and Black. Navy is shown above. Don't settle for cheap imitations. 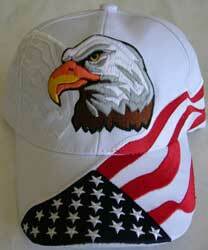 Wear the official USA Flag Eagle hat with pride—get one in every color. Minimum order: 48 hats. Also, available with a name drop (name only, not logo) over the opening in the back of the hat. 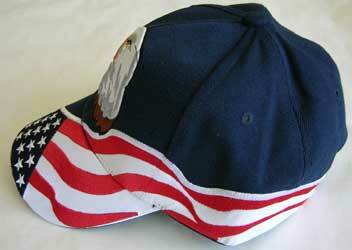 There is a one-time set up fee of $30, plus $2 charge per hat for the name drop in addition to the wholesale cost. Call for prices. 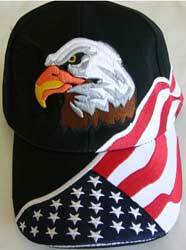 USA Flag Eagle hats are available with your logo embroidered on the front of the hat (instead of the eagle). Minimum order is 144 hats. Call for details about submitting your logo and for quantity pricing. Perfect for your group, company, association or organization. 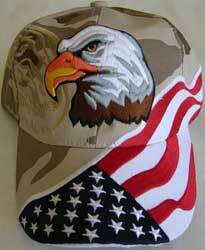 Get your USA Flag Eagle hat today. Ships via Priority Mail.